You can buy here Kanchipuram silk sarees online at manufacturer price. The same quality kanchi sarees are sold double the price at other shops. Before you make a purchase, If you need any clarifications on any of our Kanchipuram Silk Sarees, Please contact us at +91 - 9677063537 All our Kanchipuram Silk Sarees will be shipped from Kanchipuram and the Delivery time is within 7 working days for USA and Canada. Why Choose us? You can buy silk sarees at wholesale price. We can send it as gift to avoid import taxes for your country. Free Shipping with in India. Do you want more discount in price? Click on the saree that you like. Next click on the facebook icon to the left. Sign in and share. You get 10% off of your total amount. Please read fabric description to know if it is pure silk or designer silk. All pure silk sarees will come with silk mark tag. 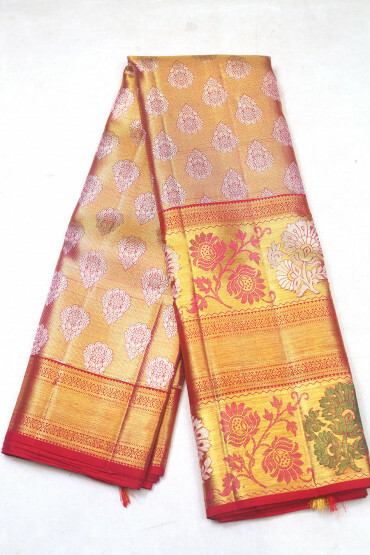 Kanchipuram silk sarees are undoubtedly ‘pride of the wearer and envy of the onlookers’. Kanchipuram saree to an Indian woman is like royal and lustrous yards of silk, meant to be flaunted on special occasions and an asset to be cherished throughout her life. Every Indian bride wants a Kanchipuram silk saree in her trousseau collection, which she can treasure forever. Why is Kanchipuram silk saree special? Kanchipuram sarees are handwoven in pure silk, with intricate motifs of zari, which are silk threads dipped in gold or silver. What make this saree exceptional are the elaborate designs which are interwoven in the body of the saree with gold zari. The motifs are inspired by human figures, animals, temples, flowers or birds, and are woven in the pallu and border of the saree. Borders are made in contrasting colours and traditional designs are infused in them. 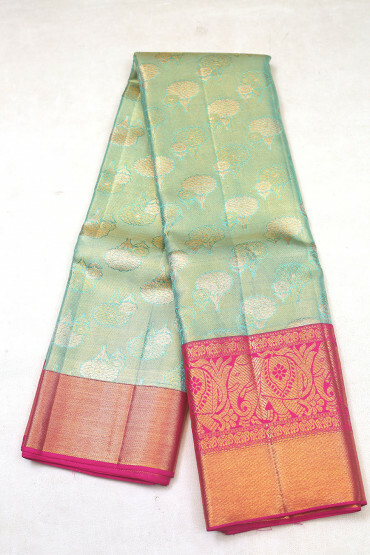 Kanchipuram silk sarees are expensive due to its fine count weaves in gold threads, silky finish and high quality sheen. This product must be stored carefully in muslin covers, away from sunlight and heat, in order to preserve it forever. 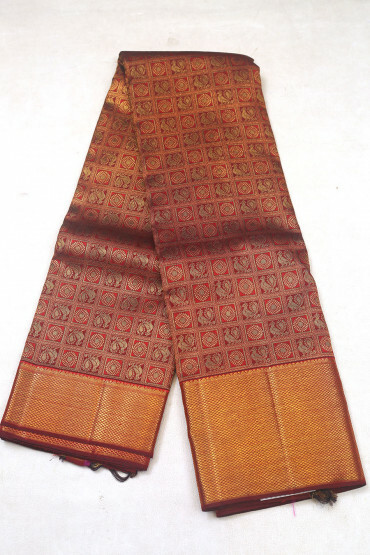 Kanchipuram silk saree is incorporated with two materials, which are silk and zari. Pure mulberry silk is interwoven with shiny gold or silver zari threads, which are sourced from Gujarat. Three shuttles are used in weaving a kachipuram silk saree and two workers work side to side on a single saree. Border is woven in contrasting colours and pallu is woven separately and attached later to the saree. Checks, parallel lines or butis are made on the body of the saree in designs like peacocks, parrots, ambi, leaves etc. Other expensive variants have royal pallus with Raja Ravi Varma paintings instilled on them. Kanchipuram silk saree is an invaluable legacy which is profoundly embedded in the ethos of every Indian woman. People of Kanchipuram are obsessed with the art of weaving and they have formed co-operative societies, which look after the welfares of the weaver community. Newest trend in Kanchipuram silk saree is usage of embellishments like Kundans, beads and crystals in the Kanchi Pattu variety. These sarees are worn on weddings, functions or parties and are ideal for gifting. Kanchipuram Silk Saree is not only confined to Tamil Nadu itself, in fact it is liked by women globally due to its traditional ethnic varieties woven in pure materials. As world is going organic, one cannot ignore handloom weavers who have restored the cultural heritage of India in genuine materials.